Stella McCartney loves to play around with prints. She’s a big fan of humor, cartoon drawings, and whimsical motifs, having previously designed collections decorated with colorful animals, cloud illustrations, and superhero masks. 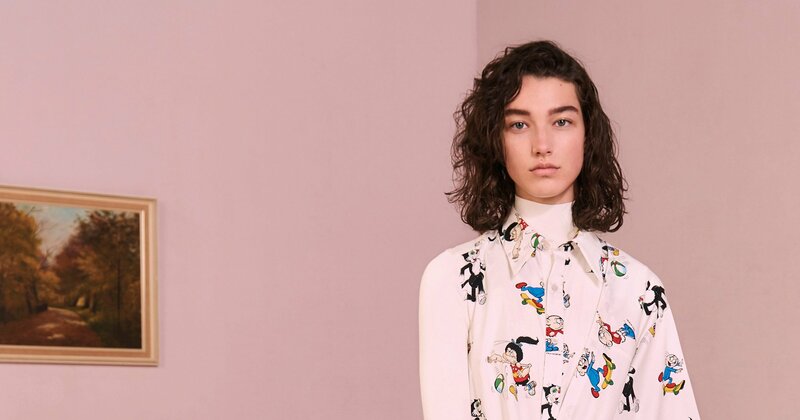 As of late, McCartney’s imagination has been taken hold of by what many nostalgic English folk consider a childhood staple that goes by the name of The Dandy.During her Pre-Fall 2017 presentation, McCartney debuted two looks printed with characters from the U.K.-based DC Thomson comic strip. Names of the mischievous cast featured on the drawstring trousers, blouse, and shirtdress include Korky the Cat, Dinah Mo, and twins Cuddles and Dimples. In addition to the pieces shown in the Pre-Fall lineup, The Dandy clan will also be featured on T-shirts, jackets, and jeans, as well as an embroidered sweatshirt and intarsia knitwear. Prices for the 15 new pieces will run from $240 to $1,795.